Dean has black henleys too! This is a catch category for all the times he wears one. It’s extremely hard to see, but I believe Dean is wearing a black Henley at the end of Children Shouldn’t Play With Dead Things (2x04), when he confides in Sam at the side of the road at the very end of the episode. 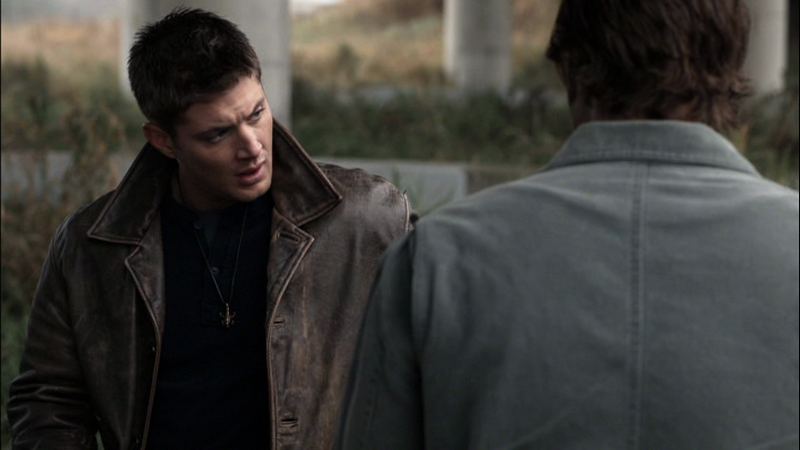 In Family Remains (4x11), Dean wears a black Henley at the very end of the episode, when he admits to Sam about his enjoyment of turning torturer. In Devil May Care (9x02), Dean wears a black Henley when he and Sam go to rescue the Hunters that Abaddon has captured. He keeps it on until that fight is finished, and then changes before arriving back at the bunker. This black Henley has white stitching around the buttons at the collar, which sets it a little bit apart from Dean’s more generic black henleys. In Lily Sunder Has Some Regrets (12x10), Dean wears this in the beginning of the episode when they are in the Bunker and in the car as they travel to the scene of Benjamin’s death. Huh. I wonder if it was a conscious choice, since black is associated with darkness/sorrow/hidden things, that Dean wears black henleys during his two big confession scenes with Sam. "When he admits to same about his..."
Also thanks for all of the detailed info, I've used the Super Wiki/your site quite a few times to double check and reference SPN clothing info. Keep up the awesome work! And I'm glad that I've been helping provide a good reference for you! Yup, that's a black henley. Henleys are hard to tell apart.